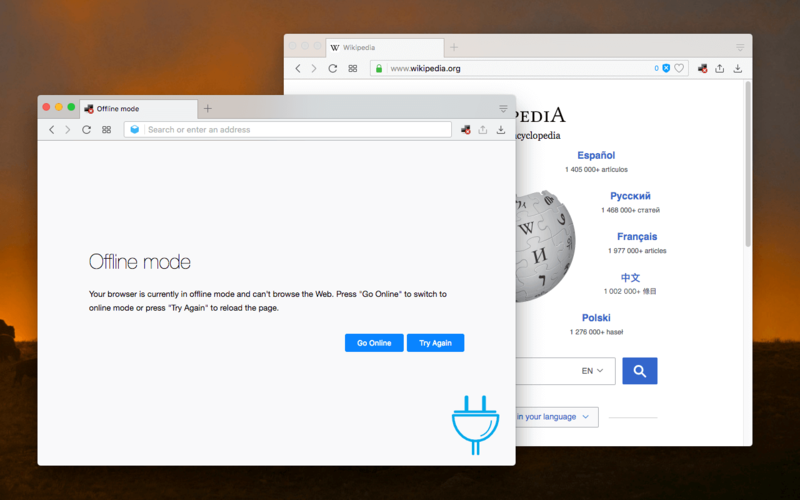 "Work Offline" extension adds a toolbar button to your browser to prevent web pages from accessing your network while the offline mode is enabled. The toolbar button is colorful when the network is not accessible and is gray (the default mode when the extension is installed) when it is accessible. Note that this extension is designed to prevent web pages from accessing the Web not your local extensions. So if you have a notifier extension for instance, it can still access the network as usual. What is the "Work Offline" add-on and how can I use it? This extension brings the "Work Offline" functionality in the Firefox browser to all other browsers. In oppose to the Firefox's default offline mode, this extension only prevents web pages from accessing the web so your installed extensions can still observe the web or push notifications. This way you can be connected but your privacy is guaranteed. The extension adds a toolbar button to your browser. When the color of the "x" is red, the offline mode is enabled hence no web page can be browsed (you can confirm this by placing your mouse over the toolbar area to see the current online or offline mode). If the "x" is gray, the extension is not blocking any request and you can simply browse the web. Note that when you are in the offline mode, you can not browse any web page, and already opened pages cannot update themselves. For instance, if you have an open Gmail page, it cannot check for updates. However, if you have a Gmail extension, it still can update the counter. Does this extension affect my browser performance? When the extension is active (offline mode), a network observer is installed which rejects all the page level requests. When the extension is disabled, there is no network observer hence the extension has no effect on your browser at all. Does this extension keep its state when I reboot my computer? I want to make sure my browser is not connected when it gets opened. Yes, the extension's enable and disable state is persistent across browser sessions. It means, if you are in the offline mode and close your browser, you will still be in the offline mode when your browser gets opened next time. Can I open local web pages when offline mode is enabled? Yes, this extension blocks all the requests from and to the Web. So you can still open local HTML files and work with them in the offline mode. Actually, it is safer to enable the offline mode when you are opening an unknown local HTML file to make sure it has no access to send stats to an external server. Is it possible to make a single tab work in the offline mode? As of version 0.1.2, there is a new item in the right-click context menu over the page action to toggle the offline mode for the active tab. If the tab is in the offline mode while the extension is globally in the online mode, only this single tab cannot access the internet. To remove the blockage, right-click one more time and press the toggle item again.